« Can’t make it to Anime Expo this year? Watch it live thanks to SimulTV! Good news if you’re planning on attending this year’s Anime Expo: the program schedule is now up! Go grab it now (in PDF format) and plan away! With a huge guest roster, not to mention the myriad of traditional (and even quite a few not-so-traditional) events that you typically find at anime cons, there’ll be lots to do and see. 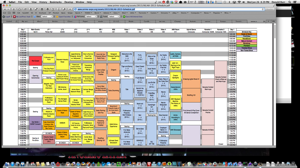 And now for my yearly “Why the hell aren’t more cons using smartphone/tablet scheduling apps? !” rant. More and more people have ’em these days, and they make excellent companions while you’re at con. So why aren’t more cons putting out their schedules as smartphone/tablet apps?! Sure, you can load up the PDF schedule in a PDF reader, but that’s clunky compared to an actual schedule app. You can do so much more in an app — searching and marking favorite/want-to-watch events (and setting reminder alarms to automatically notify you X minutes before said events) being the two most important benefits of app-based schedules. In years past AX has put out an iOS schedule app which, while quirky and non-standard, still worked reasonably well. More recently, they’ve gone with a web app (an “app” that runs within your device’s web browser.) Not only does this require a data connection (expensive, and doesn’t work too well (if at all) in most convention centers, aka giant steel and concrete structures that eat radio signals for breakfast), it was also slow, buggy and a pain to work with. Why oh why can’t they go with a well-established scheduling app that well over 9,000 other anime conventions (not to mention a lot of other conventions) have used, such as our favorites, Guidebook? OK, end of rant. (disclaimer: we have no connection with Guidebook, nor do we benefit in any way, financial or otherwise, by mentioning them. We just really love their app.) Guess what, the schedule is now available in the Guidebook app too! By the way, pre-registration is still open (and is highly recommended; it really helps cut down on linecon) and will run you $70 for a full 4-day adult pass, $60 for a 2-day pass, $40 for a single day pass, and $20 for an expo hall only pass; child (6-12) passes are $25. And if you haven’t made your hotel arrangements yet (shame on you!) as of the time I am writing this, there are still rooms available at the Sheraton LA Downtown and the Millennium Biltmore; better book ’em now (Danno) while they’re still available.